Please support CRSA’s continuing efforts to preserve the Carmel River Biosphere. The Federally Endangered Steelhead Trout we are conserving are a wild and native genetic strain of fish specific to the Carmel River watershed. With global warming and rivers becoming warmer these southern genetic strain of fish are what are expected to populate northern rivers as they warm. With your support, you or your Family will support the conservation and restoration process. CRSA is a non-profit group of volunteers that, since 1974, has advocated for the restoration of habitat and fish in the Carmel River and its tributaries.When you become a member of the solution and dedicated to protect this watershed you will help the Native Wild Steelhead of the Carmel River recover. CRSA is the only organization whose focus is specifically on the needs of these threatened local fish. Agencies and other NGOs have things other than steelhead as their primary focus. Examples are: 1) The Monterey Peninsula Water Management District, while performing good work on the river, is also the agency whose primary responsibility is securing adequate water for the peninsula, which can cause a conflict of interest. 2) The Carmel River Watershed Conservancy which focuses on protection of the natural resources that form the Carmel River Watershed attempts to balance environmental protection and the diverse needs of the community. Protecting steelhead necessitates working with and, if necessary, challenging agencies and other organizations that have great power over the river and steelhead. With a large and strong membership base, CRSA is in a better position to do this work. A run of fish such as steelhead indicates a healthy river, watershed and community. Our Carmel River run of steelhead was in excess of 18,000 in the 1920’s and has declined to an average of 242 recorded fish over San Clemente Dam between 2006 and 2015. These are tough determined fish and they and their river do need help! Please join and help CRSA advocate for steelhead and the Carmel River habitat. 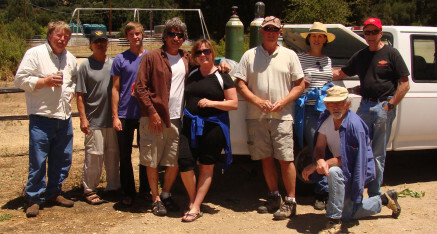 The Carmel River Steelhead Association is an all-volunteer organization. While the CRSA board members do the day-to-day work for the organization, it is the countless other volunteers that are the backbone of CRSA. Without the help of many, CRSA could not do the fish rescues, habitat improvements, river cleanups, or water advocacy that have helped steelhead since 1974. Please sign up to become a CRSA volunteer. There is no requirement that anyone participate in every effort or any particular effort in a given year. Just join us when you have time or the activity seems interesting. As a volunteer you will receive the CRSA newsletter and emails when volunteers are needed as well as an email on the results of the project. If you are interested in learning more about our work and upcoming events, sign up for our monthly newsletter. The Carmel River Steelhead Association is committed to helping steelhead and the Carmel River in whatever way we can. A very important aspect of maintaining a healthy river is keeping the public informed about conditions, events and projects on the river. CRSA has given talks to fraternal organizations, NGOs, schools and groups interested in the river and steelhead. We have participated at various events with displays, handouts and volunteers to speak for steelhead and answer questions. And now with our updated website, we provide links to many other sites involved in the river to help keep you informed. If your organization or group is interested in learning more about CRSA or more about the Carmel River please contact us. We like to help if we can. There are countless websites out in cyber land. On this site we have linked many that will help you find out what is happening to or on the Carmel River. Here you will find links from real-time local rainfall to river conditions as well as links to some like-minded organizations.